When we left off yesterday, we had just gone up and down banks, and Jack was having plenty of green moments throughout the day. Well sadly, those green moments only increased from there. Our next exercise was over ditches. Oh lordy. Jack and I had yet to do a ditch together, and I suspect that the last time he did a ditch was last winter. 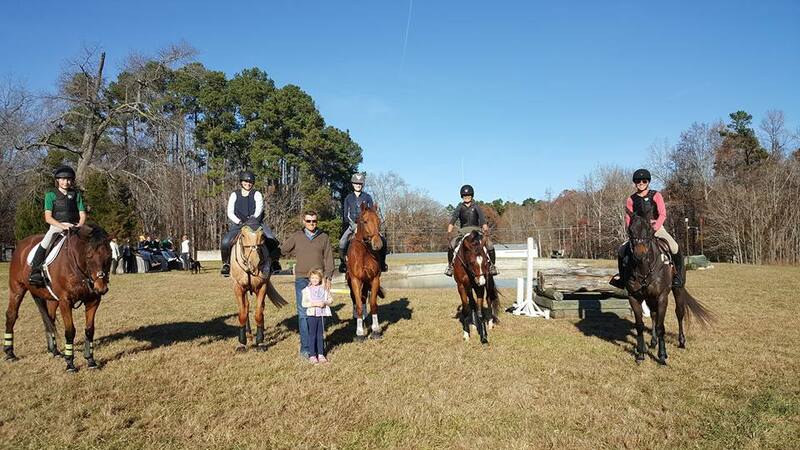 We warmed up over a tiny (like, green-as-grass) “ditch” and then moved on to the only other ditch on the property- a max-Novice (maybe even Training) ditch. Boyd schooled us through the introduction first- coming at it with more steam than necessary to just get them over it, and then slow things down on each subsequent approach. We were to have long reins, with our hands essentially in our lap in order to have our crop at a place that we could tap the horse on the ribs if need be. Again, not only am I bad at the whole long reins thing, but I also could not reach Jack’s ribs with my pony bat. After explaining to Boyd that A) I had fat thighs (yes I said this) and B) I had a short bat so C) that wasn’t working for us and D) oh yeah, and I have no idea what this horse is like with ditches, he then made me trade with another for a crop that could actually reach and sent us on our way. Below is the result of that. And yup, I nearly ran Boyd over. Multiple times. But we finally got over it, and Jack Jack got lots of pats for being a brave ponykins. You can see that we got over it a couple more times, and then we had to move on to the next thing. 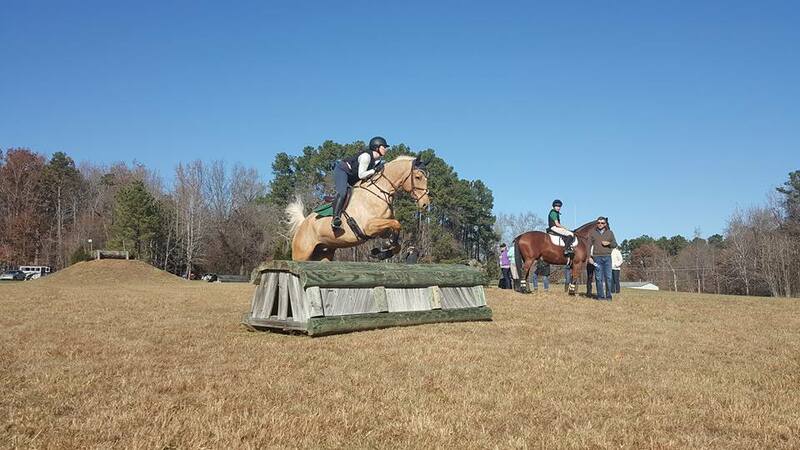 We have a schooling planned for a different venue in a couple weeks that has different levels of ditches, and this is definitely one of the goals for that session. Get ready for moar ditches, Jack! At that point, I won’t lie, I was a little brain dead. But we kept rolling, and next on the agenda was the bowl. We were told to keep an up hill, showjumping canter through the base of the bowl, and once we got to the sharp hill (with a small fence at the top), we were to accelerate and not pick to any kind of spot. Then the task was to roll back to a small log going back down the hill, and then reverse the order. Welp, you can see how that went for us. I should have fought for it more, in truth. He tried spooking at the hanging log on the way back down as well, but I got him over it the first time. Pony- stop being such a spaz! We wrapped up the day at the water complex. Going through at trot to get their toes wet, and then trotting up and out up a bank to a small log, which happily rode really well for the golden boy. Doing that in reverse… well, not so good. Again we got in a pickle of there not being a baby-version of the drop into water to work with, and despite trying a leader and lots of encouragement, Boyd suggested I come back and school that another time. We finished by cantering through in order to end on a good note. 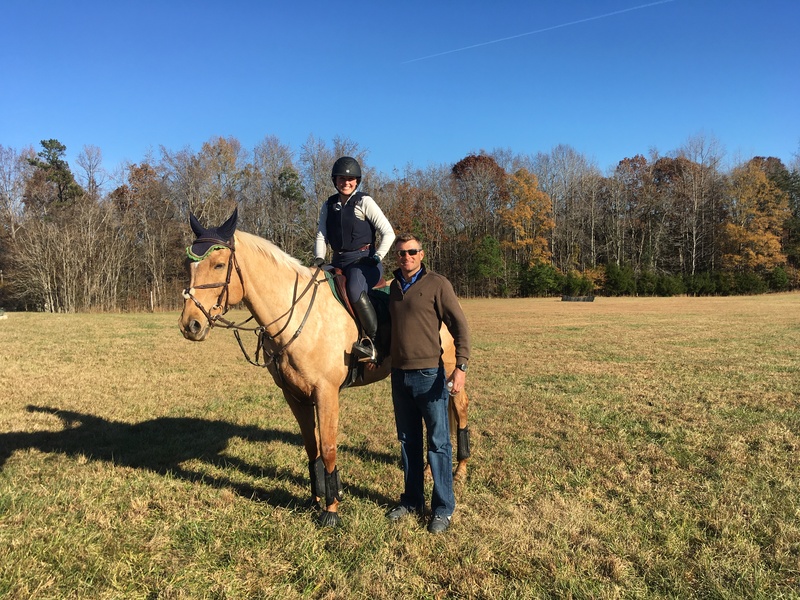 Overall I found Boyd to be a very positive instructor, whose knowledge and experience really shine in showing how to approach different fences based on the type of horse you are riding. He definitely showed us where there are holes in our training, particularly on cross country, and I now have a plan on how to fill those holes and prepare for competition settings. Thanks to all the folks who came out to audit and take the video/media you see on the blog this week, and thanks to Boyd for kicking our butts and still giving us hope! I’ve had the pleasure of meeting Boyd in person twice, and he’s one of the nicest, most genuinely warm riders in the sport. A huge part of me wants to clinic with him even though I don’t event, because he seems exactly like you described: always positive, encouraging and rewards the rider and horse for a job well done. I also really admire Boyd’s horsemanship: I’ve never seen him get angry at his horses or yank on their mouths or beat them with a crop…he’s the true definition of a professional. He’s really a joy to watch, and I’m glad you and Jack had such a great experience!! I agree… he’s completely charming! And a great horseman- he was honest in his assessment of each pair, but more than fair. Sounds like an overall great experience. I would love be to clinic with Boyd sometime. 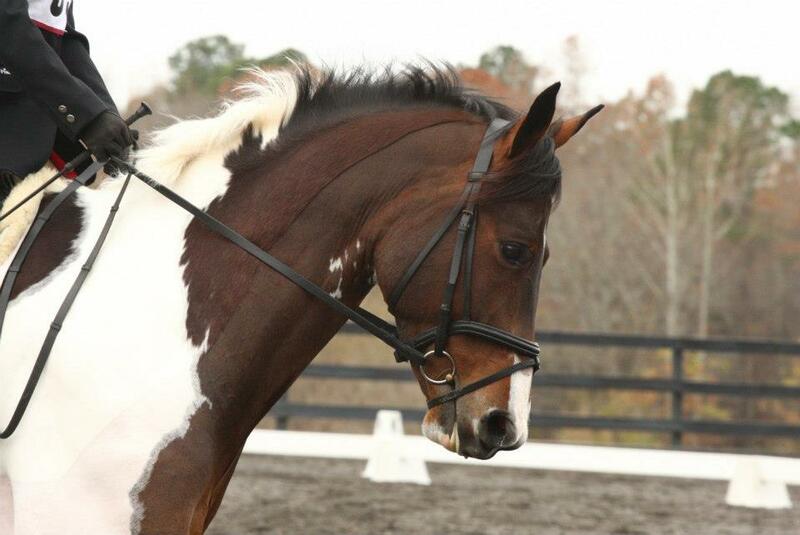 Aw poor Jack looked so concerned about the ditch at first! Nice job working him thru it! It’s so frustrating to run into an issue with ditches or banks or whatever and not have smaller variations to school for the greenies. Seems like Boyd had a lot of good insights for jack tho!! Yes- it was a bit of a shame that we couldn’t ramp up to that size ditch in a normal way. I’m hoping our next outing with all the ditch options will be a real confidence boost! First congrats! You both looked great and second, congrats again on not running Boyd over. This has me now really wanting to do some clinics. Always my first goal of a clinic, to not run the clinician over. I thought you did a really, really good job of schooling Jack through his rough spots and even though it kind of wasn’t his day, you both learned a LOT and accomplished a lot! !